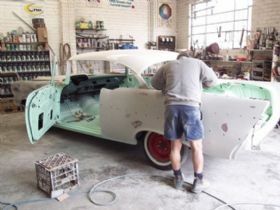 Joscar Smash Repairs is a father and son body restoration business that specialises in Tri-Five Chevrolets from 1955 through 1957. It is owned and operated by Joe Dalfonso who started the business in 1983 in Lansvale and then moved the business to its current location in 1986. Joe has been in the industry for forty five years and his son Brian has followed in his footsteps and chalked up twenty years experience in panel beating and spray painting. Joes love affair with early Chevrolets started many years ago when he used to go rock n roll dancing and a friend had a 1957 Chevrolet. He fell in love with that car and the passion still burns strongly for all 57 models. Brian became an admirer as well and his passion is the 55 models and between the two of them they have an enviable collection of various body styles covering both years. 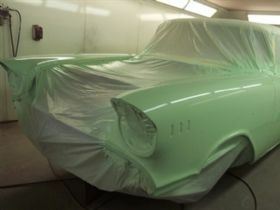 The workshop caters comfortably for four cars at any one time and they have a double sized spray booth for laying down their show quality paint jobs. They have a miracle puller, MIG welder and silicon bronze welder that enables them to cover all customer requirements in house. 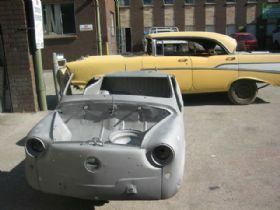 In the workshop they also stock a range of spare parts for Tri-Five Chevrolets that include panels, moulds, rust repair sections, some steering components and dashboards. 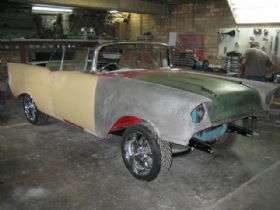 They offer a range of services to a customer that covers the full spectrum from small touch ups to full turnkey cars. 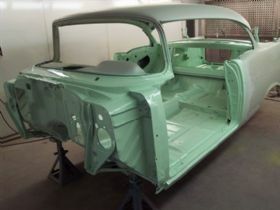 With trade backgrounds in panel beating and spray painting they offer these services along with rust repairs, fitting and aligning replacement panels, fabrication and modifications. They have performed many right hand drive conversions including supply and installation of steering components, steering columns and dashboard modifications. 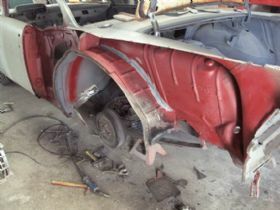 With the trend towards nice smooth surfaces they are often called upon to provide smoothed firewalls, dashboards and welding up unsightly seams to provide customers with the kind of professional job they are looking for. They also provide a paintwork polishing service to rejuvenate your cars finish. Joe and Brian are willing to assist anyone stuck in the middle of a project and can offer advice on what is required to bring it to completion or if a customer wants to move on they are also open to purchasing part finished projects. 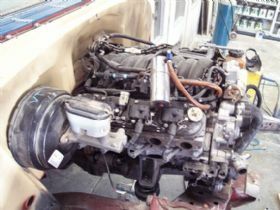 They also buy and sell complete Tri-Five Chevrolets and through their many connections have assisted customers to find the right project or completed car for them. 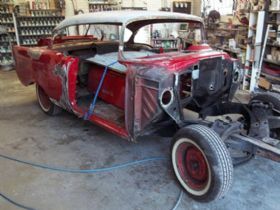 Both Joe and Brian pride themselves on their customer service and offer friendly, expert advice for anyone contemplating a restoration, conversion or new paint job. Because they have a passion for the marque and have worked on many of their own and customers cars they have a deep understanding of what is required, the many options a build can take and they focus their efforts on doing an outstanding job to exceed the customers expectations. 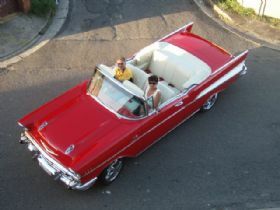 Over the years they have worked on many different classic cars including all the Tri Five models, a 1959 Cadillac Eldorado Biarritz, Dino Ferrari, numerous Porsches, a three wheeled Mazda, MGA, Fiat 600 and numerous Mustangs. 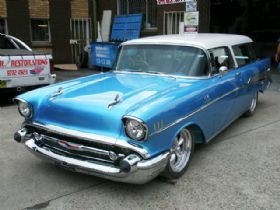 Both Joe and Brian are members of the 567 Chev Club and the Chev Club of Australia. The business also sponsors the 567 Chev Club All Chev Day in October. 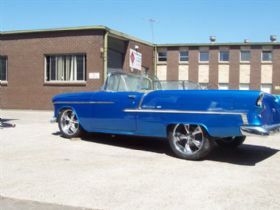 If you share their passion for Tri-Five Chevrolets and are looking for a professional body shop to provide a wide ranges of services for your classic give them a call on (02) 9772 4923 Monday through Friday from 7.30 to 5.30 and Joe and Brian will be happy to discuss your requirements.